Users may periodically find that the dark areas of a photographic print appear murky and lacking shadow detail when compared to the digital source image. The Black Point Compensation feature is useful when printing images from large gamut sources such as photographs or other RGB images. RGB colour spaces allow for black points significantly darker than those that can be reproduced by a CMYK printer. Black Point Compensation assists by moving the darkest black in the image to the darkest black achievable by the printer. This re-mapping enhances shadow details, prevents over-inking in CMY gray/black areas and ensures the dynamic colour range of images is correctly converted to the printer’s gamut. 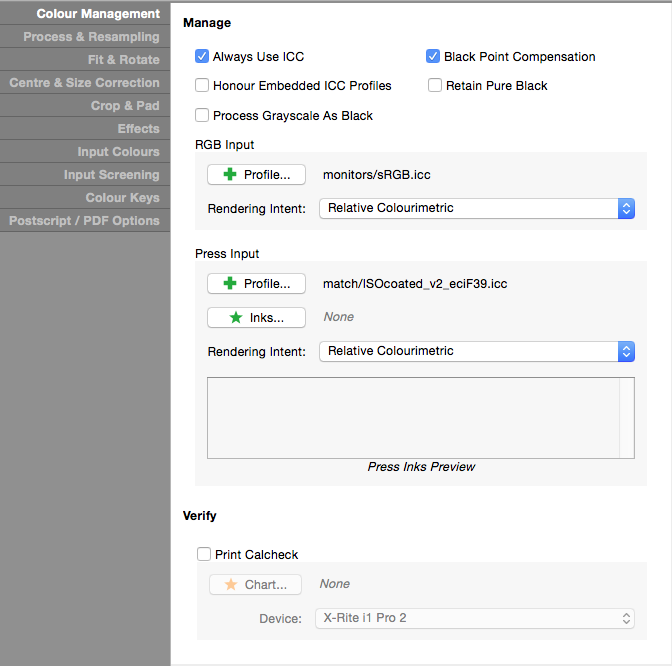 Black Point Compensation is activated via the Colour Management panel of relevant Job Ticket in the Workbench application. The setting only functions when using Colourimetric Rendering Intents (Relative or Absolute) and when ‘Always Use ICC’ is checked. NOTE – While good for printing photographs, Black Point Compensation should not be used for CMYK proofing jobs, which are generally well within the gamut of a CMYK inkjet printer.